*Make couscous 1st – directions below. 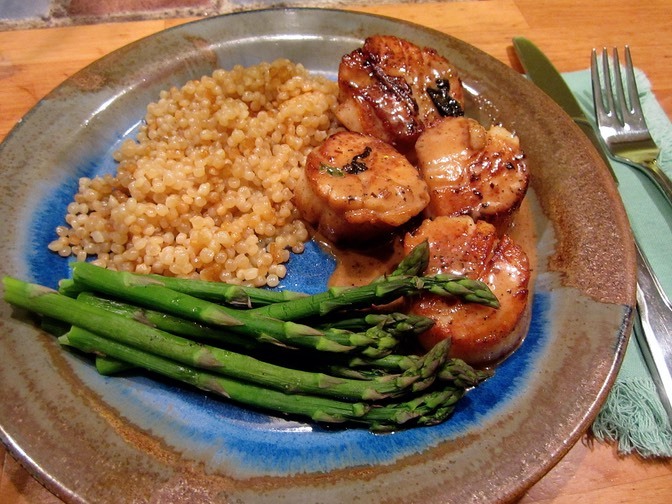 While it cooks you have exactly the right amount of time to cook the scallops and sauce. In a large, heavy skillet over high heat, melt 2 tablespoons butter with olive oil. Pat scallops dry with a paper towel and season with salt and pepper. Add scallops to the skillet and sauté until cooked through and nicely browned, about 2 to 3 minutes per side. Transfer scallops to a platter and tent with foil to keep warm. Don’t wash skillet!! Lower heat to medium high and to the same skillet add the cider, wine, maple syrup, and shallots; boil until liquid is reduced to about half 1 to 2 minutes. Add 1 Tbsp butter, whipping cream, and thyme. Boil until mixture is reduced to sauce consistency, about 2 minutes. Return scallops to the skillet and stir until heated through, about 1 minute. You can follow package directions for two serving. I did that, but substituted chicken broth for water, and sautéed the couscous with one minced garlic clove in one Tbsp of melted butter for about 1 minute before adding the liquid.